'A fascinating hybrid. Part freewheeling history of the rise of the modern autonomous vehicle, part intimate memoir from an insider who was on the front lines for much of that history, Autonomy will more than bring readers up to speed on one of today's most closely watched technologies' Brian Merchant, author of The One Device From the ultimate insider - a former General Motors executive and current advisor to the Google Self-Driving Car project - comes the definitive story of the race between Google, Tesla and Uber to create the driverless car. We stand on the brink of a technological revolution. In the near future, most of us will not own automobiles, but will travel instead in driverless electric vehicles summoned at the touch of an app. We will be liberated from driving, so that the time we spend in cars can be put to more productive use. We will prevent more than 90 percent of car crashes, provide freedom of mobility to the elderly and disabled and decrease our dependence on fossil fuels. Autonomy tells the story of the maverick engineers and computer experts who triggered the revolution. 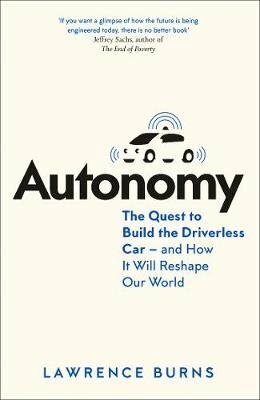 Lawrence Burns - long-time adviser to the Google self-driving car project (now Waymo) and former corporate vice president of research, development and planning at General Motors - provides the perfectly timed history of how we arrived at this point, in a character-driven and vivid account of the unlikely thinkers who accomplished what billion-dollar automakers never dared. Beginning at a 2004 off-road robot race across the Mojave Desert with a million-dollar purse and continuing up to the current stampede to develop driverless technology, Autonomy is a page-turning chronicle of the past, a diagnosis of the present and a prediction of the future - the ultimate guide to understanding the driverless car and to navigating the revolution it has sparked.